Madison apartments rent either August 15th to August 14th, September 1st to August 31st or July 15th to July 14th. Average rents for apartments in Madison range from $550 for a studio to $3,000+ for a 2 bedroom luxury apartment. The downtown area is very commutable to residents living further away, giving the whole city a connected feel. You can hang your hat pretty much anywhere in the city and get the full experience. However, the tight move-in dates and low vacancy rate make it frustrating to find a downtown apartment. Here are some insider tips to help you find your next apartment. 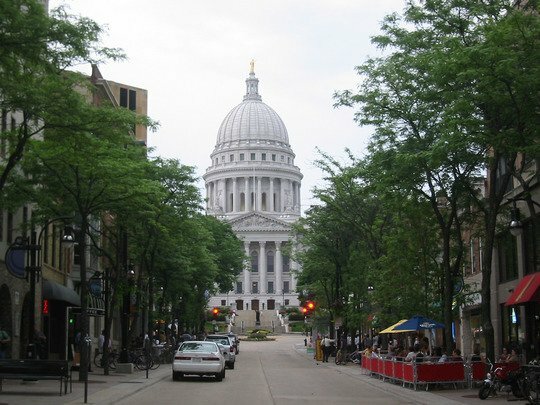 A progressive, university town centered around a state capital on an isthmus. It is the home to Wisconsin’s political scene, many thriving businesses, and the gigantic University of Wisconsin campus. Its 240,000 citizens love its urban downtown surrounded by lakes and greenery. A city bustling with new students and young professionals scrambling to find a place, so housing can get really competitive. If you want the best selection, begin your apartment search in November. Most leases are signed in February to give landlords plenty of breathing room for the strict August 1st and 15th move in date. Madison apartments are available off-season, but expect to increase your budget or lower your expectations. Searching for an apartment can be tough. That's why we scour the web to get all best listings around town. And our team of local experts verify the quality and accuracy of those listings to make sure that you have the best prices, images and information available. So unlike searching for an apartment on Craigslist, you can be sure that ABODO’s apartment listings are safe, trustworthy and accurate. Landlords here can be tough. High demand for their apartments means that your applications need to be on time and looking sharp. Expect the apartment landlords to be sharp, tough, but fair. You're likely live, play, and shop in your neighborhood. The University of Wisconsin's flagship campus and student living occupies a fourth of the city, while the business professional downtown areas and hipster east-side comprise almost all the rest. Here's some of the most popular neighborhoods to help you get sorted. Getting around is not always easy -- either with or without a car. Parking downtown can be spotty and pricy, while the east-west bottleneck on the isthmus makes navigating... interesting. However, most neighborhoods have the essentials within walking distance, but getting to the large shopping center on the outside of town takes a car and patience or an iron will to navigate the bus system. The bus system is reliable, won't get you everywhere, and is definitely not 'on-demand'. On the other hand, if you're a bicyclist, you're in great company with enthusiastic cyclists on biker friendly trails and streets everywhere you look. This is the cultural hub of Wisconsin for good reason. The University brings in top-tier performers and more college sports than you can handle. On the other hand, the Capital Square's Overture Center and dive-bar-to-fine-dining restaurant selection will keep you full and entertained. If you want something with a little more grunge, head to the east side and check out live bands, improv performances, and poetry readings at some more eclectic bars and cafes. For a small town, there are plenty of attractions to offer both locals and out-of-towners. One of the most popular destinations is the Olbrich Botanical Gardens, a 16-acre oasis featuring sunken garden, more traditional landscapes, and a closed conservatory brimming with exotic plants. The Henry Vilas Zoo offers free access to some of the most adorable (and frightening) beasts that nature has to offer. The Arctic Passage exhibit is one-of-a-kind, featuring polar bears, grizzly bars, and harbor seals. Baby, is it cold outside? Not to worry. Though outdoor activities are loved by all, there are quite a few things to do indoors as well. Take a tour of the Wisconsin State Capitol, a majestic classical style building that offers an incredible snapshot into the history of the city. The university also offers a Geology Museum that makes rocks and ridges surprisingly interesting with its informed staff and unique exhibits. This college town can rival NYC or Portland in the food department! Grab spectacular farm-to-table cuisine crafted by a James Beard Foundation award-winning chef at L'Etoile or Graze. For lunch, bite down on the best cheesy sandwiches at Fromagination, a part cheese shop and part lunch shop that's been called the "chapel of cheese." If you're a pork lover, head on over to A Pig in a Fur Coat, which boasts a unique menu brimming with game meats like rabbit and quail (but pork is the highlight, of course!) Love to cook? The Dane County Farmers Market is the largest locally produced farmers market in the country. Held every Saturday and Wednesday in Capitol Square during the summer months, this is the perfect place to grab fresh ingredients for your favorite meals. You can get your hands on a wide variety of goods ranging from fresh-made cheeses to locally cured meats. A college town through-and-through, so it’s no surprise that there are a number of bars to choose from when you want to enjoy a night out. Plaza offers affordable drinks in a welcoming atmosphere reminiscent of the 70’s, making it a universal favorite among residents and college students alike. If you want a prime place for partying all night – and possibly not remembering half of it – head over to Mondays, which serves some of the strongest drinks in town. Wando’s sports bar that offers many a television, fish bowls, and $1 beer night. If you're looking for more sophisticated libations, check out The Old Fashioned, known for its namesake cocktail, as well as its extensive craft beer options. Want to leave the crappy liquors of college behind and dip your foot into the craft cocktail pond? Merchant is known around the neighborhood for its exceptional craft cocktails and approachable bartenders who can help you choose the best mix for your tastes! Offered is a buffet of options for culture enthusiasts and artsy types, ranging from theater to fine art. Attend a concert at the Orpheum Theater, a historic venue that was once home to vaudeville shows. Theater geeks can catch the latest productions of local playwrights or new renditions of Broadway hits at the Overture Center for the Arts. Art nerds can head over the the Chazen Museum of Art, which features an incredible regional collection, as well as European works by famous names like Rodin and Vasari. If architecture is more your thing, take a look at the Monona Terrace. This gorgeous community space was built by Frank Lloyd Wright and offers stunning views of Lake Monona. During the summer months, residents can't get enough of gathering around outside to enjoy good music, foods, and company! Music fans can get tipsy on the Capitol Lawn during Concerts in the Square, where the Wisconsin Chamber Orchestra offers Wednesday evening concerts from June to July. can't get enough ear candy? Try out the Concerts in the Garden series, a Tuesday concert series in the beautiful Olbrich Botanical Gardens that feature all kinds of tunes ranging from jazz to honky-tonk. Beer lovers can revel at the Great Taste of the Midwest, a beer tasting festival at Olin Park that boasts hundreds of beers, as well as multiple stages worth of live music for attendees to enjoy! On a weekend in July, art lovers can enjoy Art Fair on the Square – one of the Midwest’s most esteemed art fests featuring hundreds of artists coming from a wide variety of disciplines and backgrounds! There's a little bit of everything in the shopping department, ranging from feminist bookstores to mainstream labels. State Street houses over 200 eclectic shops. Whether you're looking for handmade raspberry bath bombs or gorgeous fossil jewelry, you'll be able to find it on State Street. Monroe Street also includes several specialty stores, including interior design studios and Native American jewelry stores. If you're searching for the more traditional mall experience, check out one of the three in the area. East Towne Mall offers a standard shopping experience with chain stores and a food court. The West Towne Mall contains more upscale designer chains, while the Hilldale Center offers the Sundance Theater, along with a healthy mix of local and chain stores. College sports reign supreme here. It’s difficult to imagine many more beloved places in the city than Camp Randall, the stadium that hosts joyous Badgers games throughout the football season and, when full to capacity, becomes the fifth largest city in the state of Wisconsin. Badger sports aren’t confined to the fall, though! After football ends, simply have to head over to the Kohl Center to see some Big 10 basketball or hockey. Or you could simply walk next door to the Labahn Arena to watch one of the best women’s hockey teams in the country! If you’re looking for something where the athletes get paid (if only meagerly), you can check out some of the semi-professional action going on in town. The Alliant Energy Center is home to the newly founded Capitols hockey team. Caps games have quickly become very popular events, especially on dollar beer night! If winter sports aren’t really your thing, no worries! During the warmer months you can head over to Warner Park and take in a Mallards game. It may only be minor league baseball, but that doesn’t make the games any less fun! If you’re the outdoorsy type, you’ll find the city has a lot to offer! It all centers around the fact that the city is bordered by four lakes, two of which straddle the downtown area. Several city parks and UW’s Memorial Union offer canoe, kayak, and stand-up paddleboard rentals, giving residents adventurous was to access to the water! The fun doesn’t stop when the lakes freeze over, as ice fishermen and cross country skiers take over the lakes. If you’d rather stay on land, don’t worry, there's a ton of opportunities for you to take advantage of too! From the over 200 miles of bike paths to the almost 1300 acres of renovated grasslands and forests in UW's Arboretum, it's a haven for those that love to live and play outside. If you’re willing to take a short drive, you can hike the bluffs of Devil’s Lake State Park or sunbathe on the sandy beaches of Governor Nelson State Park! No matter what your outdoor tastes, you'll find exactly what you are looking for.